My Model T-roadster sat in our garage for the greater portion of it's seldom seen life. Due to its constantly being under construction or repaired, it was kept from regularly drivin on the road. During my High school years, my only dating experience came as somewhat of a tragic dilemma. While cruising to a San Fernando Valley Bob's Big Boy Drive-in, and waiting in line for a parking space, the motor heated up, water pressure separated the top radiator tank and steam suddenly burst out, spraying the car in front of us. Embarrassed, we offer our apologies and lucky enough were able to mend the exploded tank, refill the leaking radiator and high-tailed it home. "Carrying tools" became a vital necessity for traveling, even when the auto club was available. 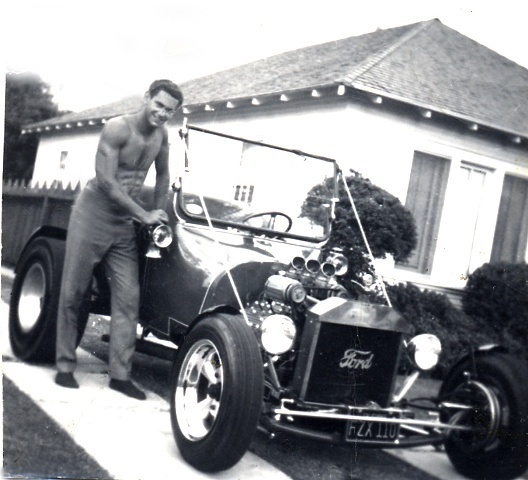 The passion for "Hot Rods" was replaced by the upgraded reliable contemporary technology for commuting. When they first arrived in the US we used to say, "What's a Honda!"